Save $2 off Benadryl Liqui-Gels! 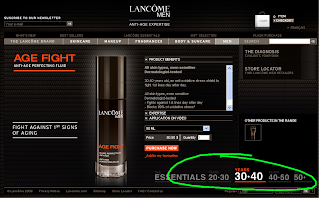 The coupon doesn't expire until December 31, 2009. Benadryl Liqui-Gels are fast acting and provide temporary relief of unexpected allergic reactions. It will relieve symptoms of runny nose, itchy nose or throat, sneezing, itchy watery eyes, and hives. All hats at Raindrops are on sale for $11 (reg. $29)! To take advantage of this sale, you need to call or email them to order (there's no advertising of this sale on their website). You can view the collection online, and then call 604-996-7246 or email raindrops@shaw.ca to order. Hat sizes are for infants up to 5 years. Raindrops uses 100% designer cottons for their hats, which are coated with a polyurethane that makes the fabric waterproof, and lined with a soft bamboo cotton or a bamboo fleece. All products are designed and manufactured in Canada, and Raindrops uses sustainable products wherever possible. 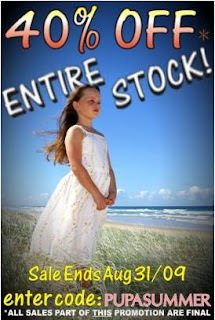 The sale is on now until July 5, 2009. If you happen to be near an Old Navy store tomorrow (Tuesday, June 30, 2009), drop in and pick up a Canada Day T-Shirt for ONE DOLLAR! Click here to find an Old Navy store near you. To get this free gift, you just fill out this online form, print out the page that follows, and bring it to a Coach store. Valid in Canada and US, no purchase necessary, while supplies last. Click here to find a store near you. Growing Growing Gone Kids Clothing is having Toonie Sale that starts tonight 10PM EST! Everything in the store is on sale, and most items will be $2, $4, $6, or $8. Up to 90 % off the original list price! The Toonie Sale runs for only 72 hours until 10PM on July 2nd. Growing Growing Gone is a Canadian online store sells new discounted brand name clothing in sizes infant to teen. Brand names you can expect to find include The Children's Place, GAP, MEXX, OshKosh, Carter's, Ralph Lauren, Calvin Klein, Liz Claiborne, and more! Roots Canada's huge Summer sale of up to 50% off select items continues, and now you can get an EXTRA 20% off select items! The discount is automatically deducted at checkout. The sale includes Women's, Men's, Kids and Babies! If you are shopping online, don't forget to log into your AirmilesShops.ca to get $1 for every $20 purchased. 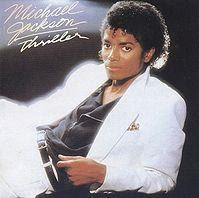 I never had a crush on MJ the way many other girls did in the '80s. But oh, how I loved the music. I will always remember Michael as he was from the '80s. WestCoastBaby.com has a sitewide sale on - 20% off all purchases! This includes already discounted sale items! 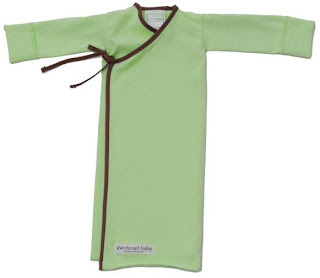 WestCoastBaby specializes in layettes for babies, like this lovely kimono wrap made of supersoft cotton stretch jersey. Stock up on your baby gifts or for you own little one during this sale! Here's another Please Mum deal for you! Buy at least $50 online and you can get 10% off your purchase by using code PMSAVING10. Please Mum currently has a huge "final clearance" sale of up to 70% off select items and other online only sales, which I blogged about yesterday, read it here. Doing laundry is one of life's facts as a Mom. Wouldn't doing laundry be just so much better with one of those lovely new HE (high efficiency) front load models? Even hubby would love showing off these machines! Enter to win a laundry solution from Maytag! They have a "Win Your Solution" where you can win either the Maytag Performance Series Front Load Laundry Pair with Pedestals, or the Maytag Bravos HE Laundry Pair - you get to choose! Click here to enter! There's a short questionnaire you will need to fill out. Contest ends July 31, 2009. The next time you visit Laura Secord, bring this coupon for a FREE extra scoop of ice cream on your next single scoop ice cream cone! Valid until July 31st, 2009. Extra scoop of ice cream can be added to any single scoop, taxes extra. Limit one coupon per customer. Click here for the coupon from Laura Secord's website! For a location near you, click here! If you can't live without your brand-name clothes for your baby, you'll love GrowingGrowingGone.ca! This Canadian online store sells new discounted brand name clothing in sizes infant to teen. Brand names you can expect to find include The Children's Place, GAP, MEXX, OshKosh, Carter's, Ralph Lauren, Calvin Klein, Liz Claiborne, and more! You can get even a bigger discount right now - they have a sale on which means you can get these brand name clothes at up to 75% of the list price! The sale might not run much longer, so shop now to get the best selection and catch the sale! Win this Giveaway for Baby or Mom from AllModern.com! I have a great giveaway from AllModern.com! It's easy! Just leave a comment below indicating which prize you would want and why! You can also get extra entries - keep reading to find out how! You can win one these five fabulous items for Baby or Mom - if you win, you get to pick the item! bObles - Tumbling Fish in Turquoise: bObles are "tumbling animals" that are both children's furniture and for creative play to help support motor skills development. The light-weight, 3-layer Tumbling Fish can be used as a seat, roll it around on its side as a toy, or as step stool in the bathroom, since it does not slide on the wet floor. Designed in Denmark, the tumbling animals are made of in a firm easy-clean soft foam surface, and is free of any toxin or phthalates.For ages 6 months and up. P'kolino - Silly Soft Pipa Seat: This cutie is both a stuffed toy and seating in one. Designed with three soft, sturdy, light weight pieces, your little one is sure to have fun whether climbing, sitting or drooling on this stuffed toy! For ages 12 months and up. Sevi - Xylophone: Sevi is known for their classical wooden toys for children. This xylophone will make a great musical addition to your child's collection. This quality Italian design is made of wood and vegetable-based paints. For ages 2 years and up. Olli Olbot - Changing Mat Bear in Pink or Blue: Super cute! The adorable bear face serves as a pillow. Leak proof and folds easily to fit into your diaper bag. Flip the mat over and use it as a super cuddly soft play mat. Fleurville - Beach Bag in White / Pink Ogo: Perfect for summers at the beach! 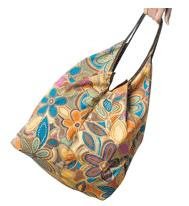 This stylish floral tulip-shaped tote is a limited edition design. All Fleurville bags are constructed of Green-LAM fabric; which is created the company's environmentally friendly polyurethane that is moisture repellent, UV-resistant, and durable. Double, triple, or quadruple++ your chances of winning by doing any or all of the following. Leave a comment for each extra thing you do, so that the entry can be counted! In the comments please make sure I can contact you by leaving either an email address or Twitter name. This giveaway is open to anyone in Canada and the USA. Contest closes at midnight PST, July 10, 2009. More fine print stuff... The winner shall be chosen by Random.org, and I'll contact the winner by email or Twitter. The winner shall have 72 hours to claim the prize. If the prize is not claimed by that time, a new winner shall be chosen. Thanks so much to my giveaway sponsor, AllModern.com. Based in the US, this store ships to Canada (some exceptions apply) and also will calculate and apply duties and brokerage fees, so that you don't have to worry about these fees when the package arrives. Check out their current sale of up to 50% off select items, and you can also get FREE shipping off orders of US$69 or more! Baby Planet Boutique is having a huge clearance sale! They have hundreds of items at up to 80% off! 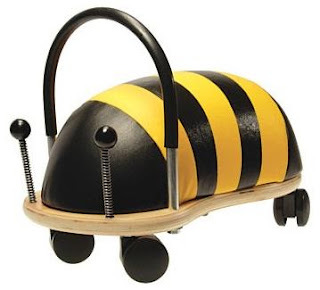 I like this ride-on Wheely Bug in the Bee pattern (also available in Ladybug or Cow), the small size is on sale now for $71.99. I also like the shirt-and-board book deals, where you get a nursery rhyme board book with matching design T-shirt - on sale now for $10.80. Choose from Itsy Bitsy Spider, 3 Little Pigs, Hey Diddle Diddle, and Wheels on the Bus. Click here to view all the sale items! GAP Canada is now having their summer sale! You'll find discounts of up to 50% off select styles in their stores. 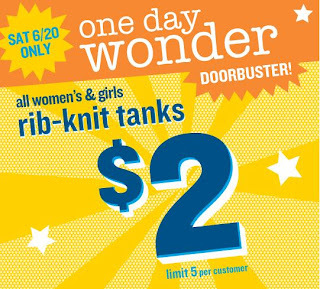 Old Navy sure has some great doorbuster sales! Their latest is the $2 rib-knit tank for women or girls. Limit of 5 per customer. Sale is on for one day only, on Saturday June 20! 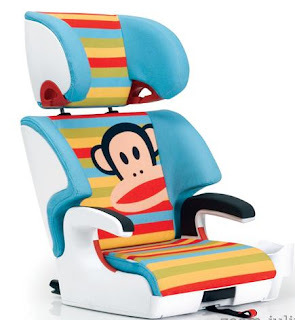 For those of you that need a car seat for a little one that's not so little anymore, you can now buy the newly released, uber trendy oobr child booster seat by clek in the whimsical style of Paul Frank. Clek booster seats are designed with an integrated rigid LATCH system, and the oobr can be converted to a backless booster seat. The oobr retails for $349.99, but if you can get $40 off if you pre-order now for shipping in September from GingerbreadMonkeys.com. Just use code oobr40 - and order by Friday June 19. If that's a bit out of budget, you can buy just the Paul Frank olli booster for $109 (reg. priced), or get the Paul Frank clekjacket seat cover (for use only with clek olli boosters), on sale for $34.99. Now how about some Paul Frank for you! Paul Frank is now designing some beautiful retro-styled cruiser bikes. You can win one from Peta2.com, which promotes vegetarianism in a very trendy way. Click here to enter the contest! Contest ends July 6, 2009. My previous posting was about TheBabyMarketPlace.com sale items. Well, they've just announced that they will be clearing out even more items over the next few weeks, so check back there for more deals later this month. This is only available for 3 days - today (June 16) until Thursday, June 18! I recently discovered the Alberta-based theBabyMarketPlace.com and it has quickly become one of my favourite stores. Why? Large selection of quality products, including clothes, shoes, toys (infant to toddler sizes), diapers and accessories, bathing products, feeding products, organic skin care products for Mom and baby, and other Mom stuff. Interesting sales, like the Bical sales (more on that below). TheBabyMarketPlace.com currently has select items on sale! 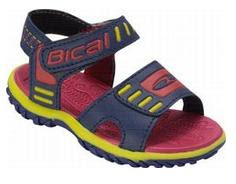 The best bargains here are these boy's Bical Sandal Surprise for just $6.50 (reg. $24.50). The 'surprise' part of this bargain, is that THEY get to pick the colour! There's also a Bical Gripper Grab & Run special for $14 (reg. $26.99), you pick the gender and size, they pick the style. A unique gift package they have is this Bonus Bundle - for $34, you will receive $67 worth of items! This makes a great baby gift! The sale includes clothing (Deux par Deux, Calvin Klein, Timberland, Hula Mula), more shoes (Jack & Lily, Little Soles), and Manhattan brand toys. Click here to view all the sale items! Surface Collective Wall Tattoos has a super online special: Get 15% off online purchases AND free shipping in Canada with code ID152009! The discount is good on top of already discounted items, too! Offer ends July 1st at midnight! If your baby decorating style is more "trendy" than "cute", then you will love the modern, contemporary look of the Kids Line wall designs from the Surface Collective. Dubbed by the Vancouver-based company as "wall tattoos", the artwork can quickly and easily turn your nursery or toddler room into a designer's dream. If you don't like the colour schemes, you can choose your own scheme from their 24-colour guide for a more customized look. Depending on the design, you can add your own creative flair to it. For example, I received the Grow! design for review. The little chicks and the letters G-R-O-W are all separate pieces, so I was able to position the design any way I like (see below for photo) Click here to see the design on the Surface Collective website, you'll see it is different. The tattoos are like giant removable wall stickers. So if you get tired of the design, you can easily remove and replace it with a new design. I have used other wall designs before, and the Surface Collective product, which is made of vinyl, is very durable in comparison (vinyl is resistant to moisture and humidity, is recyclable, and 57% of vinyl is made from common salt). The tattoo is easy to apply, you just peel off the backing, stick it to the wall, and peel off the top transfer layer. You do need to apply pressure while sticking, I used a credit card to smooth out all the bumps. Overall a super result for minimal effort! My favourite designs (aside from Grow!) are the Sleep Sheep, Hoo?, and Star Gazing. Check out the rest of their collection, too, there might be something there for your bedroom and other rooms, too! Prices start at $45. Buy now with the 15% discount and free shipping offer (use code ID152009), and it's a real deal - shipping is usually $5-$15! The discount is also on top of already discounted items, too! Offer ends July 1st at midnight! The Surface Collective website is at www.SurfaceCollective.com. peeling off the top transfer layer. Finished wall tattoo - I love it! As a new mom, the thought had crossed my mind regarding the safety these liquid-filled teethers. So I wasn't totally surprised to see this recall. 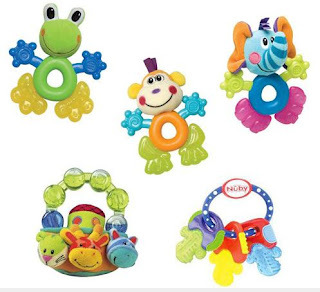 Health Canada has issued recalls on 3 models of teethers under the brands Nuby and Playgro. Note that this affect 5 different styles, see the photos for clarity. "Health Canada requires that infant teether fillings must not contain any living micro-organisms. Testing by Health Canada of these 3 teether products has revealed that the liquid filling of the teether is contaminated with the bacteria Bacillus licheniformis (in the case of the Playgro teether) or Bacillus cereus (in the case of the Nuby teethers). These bacteria generally do not cause illness. However, the bacteria can affect children with weakened immune systems, causing stomach pain, vomiting, and diarrhea, if the teether is punctured and the liquid from the teether is ingested. For full details on the recall from Health Canada, along with the exact model numbers, click here. If you have one of these products, make sure you get the $10 rebate being offered by Elfe Juvenile Products. For the Playgro Noah's Ark Toothy Teether certificate, click here. Read the recall details from Elfe here. For the Nuby Fun Pal teether certificate, click here. Read the recall details from Elfe here. For the Nuby Icy Bite Keys teether certificate, click here. Read the recall details from Elfe here. You will need to cut a part of the teether, as per instructions, and send it to the manufacturer, along with the rebate certificate. Please read the certificates for full details. Gasoline is like taxes - unavoidable (unless you are lucky/smart enough to be able to live vehicle-free). I don't recall ever seeing a gas coupon before, so for one to come is a real deal! 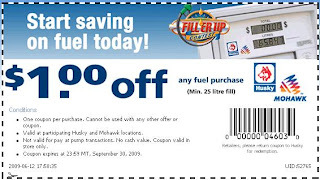 Get $1 off a 25 litre purchase of fuel from participating Husky and Mohawk gas locations. The coupon doesn't expire until Sept. 30, 2009, so print off a bunch and keep them in your car. Bookmark it, too! The coupon indicates that it is not valid for pay at pump transactions, so you will need to pay in-store to get this coupon deal deducted from your purchase. HoneyBunch Homestore for Kids has a "Spend $50, get a $10 Gift Certificate by email" promotion! Just mention "June Honey" in the comments with your order. The promotion is on until June 30. Another promotion they have is a free package of organic baby wipes when you spend $50 in their new Baby Department. 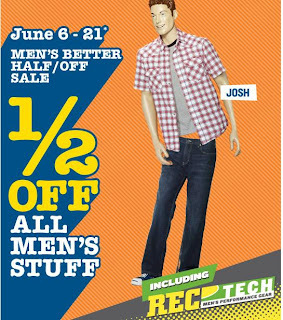 Offer is valid June 12 - 14. You can get $5 off your first order by signing up for their newsletter - they'll email you a discount code to get $5 off your first order! 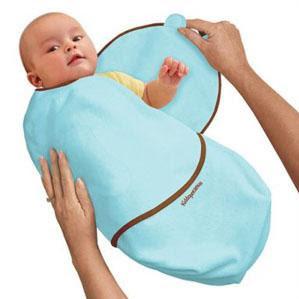 They have a lot of items on sale right now, like this Kiddopotamus Bamboo SwaddleMe blanket for $17.95. HoneyBunch has a store in Etobicoke, ON at at 3885 Bloor Street West in Etobicoke. They offer FREE LOCAL DELIVERY in west end Toronto! Their flat rate shipping is $6.95 in Ontario, and $8.95 out of province. Summer's on our doorstep but it's never too early to catch a deal for Fall! Stonz Wear Booties have select styles on sale for $29.95 (reg. price $46.95), and shipping is FREE if you choose their "No packaging" option (more on that below)! 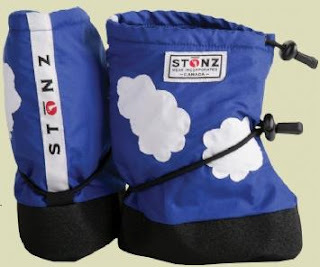 Stonz Wear are adorable baby to toddlers sized (0-3 years) booties. Made in Canada, they are water and wind resistant, with rubberized, skid resistant soft soles. They can be thrown into the washer and dryer for cleaning. You get FREE shipping if you choose a "No Packaging" option - which I think is super, it's eco-friendly and frankly I don't need that fancy packaging (unless you are gifting this). If you want the packaging, it's a flat $5 across Canada! Click here to check out the Stonz styles on sale! Get FREE shipping on ANY order TODAY ONLY (June 11) with code 611FSD at Avon.ca! If you missed the free shipping on June 11, you can still get free shipping if you purchase $35 or more using coupon code AVON35. Get a free Summer Bag with select Avon Sun purchases (which are on sale! A $20 value. Check out their Gifts & Home section too! Here's a colourful, roomy personalized tote with a window for displaying your child's name, sale priced at $9.99. Bugaloo's $15 shoe sale is back again! And if you buy 3 pairs, shipping is free (including Canada)! Bugaloo makes cute soft-soled leather shoes for babies and toddlers age 0-24 months. The shoes can be thrown into the washing machine for no-fuss cleaning! This company donates five percent of all Bugaloo purchases to Justice International Mission. Click here to check out all the cute styles! Please Mum has a VIP (Very Important Parent) special: get an additional 10% off everything in the store, using this coupon or code VIPEVENT10 when you shop online! You'll get the extra 10% off the current sales, which includes up to 50% everything in the store! New items are also 25% off! Shipping is $6.95, or get free shipping with purchases over $80. Check out their swimwear and Canada Day styles, get ready for summer! You can also win a $250 shopping spree if you sign up for Please Mum's email updates before June 25. Save $2 off ANY Tylenol product 16s or larger and 24ml or larger. The coupon doesn't expire until December 31, 2009, so go back and reprint to your heart's content! If you are a breastfeeding mom, or are pregnant, remember that no medications are best and that you should consult with your doctor before taking any medications! Do you have your 99 Free Huggies Enjoy the Ride Program Points? Add these to the 88 free points from my list here, that's a total of 99 free Huggies points! To learn more about this Huggies program and the 88 free points, click here! You don't need to purchase any Huggies products to be a part of this program! Haven't heard of the Pampers Gifts to Grow program? If you use Pampers, you can earn rewards with Pampers diapers, training pants and wipes. You just sign up for free at Pampers.ca, and then you can start collecting points. Just signed up? Get a jump start on points with my list of FREE codes here. Every package of Pampers diapers, wipes, and training pants has a Gifts to Grow code inside (mega sizes, too). Find the code, then sign in to Pampers.ca and enter it the code to accumulate points. Then redeem your points to choose items from the Gifts to Grow rewards catalog. The prizes change all the time - this past December I redeemed 50 points for a Melissa & Doug Peek-A-Boo House. Currently with 40-80 points you can only get prints or a calendar from Shutterfly, or Futura Points - none of which are very appealing rewards for me personally, so I shall wait and see what else they come up with. The Sweet Peanut Clothing Company is having a one-day baby clothes sample sale on Saturday, June 6 in Vancouver. All pieces are $10 and under and sizes range from preemie to size 6. There was a lineup last year that started at 9:30am, so expect it to be busy! Safety 1st and Eddie Bauer Play Yards are recalled. Models include the Safety 1st Play Safe Play Yard, Safety 1st Dream Magic or Deluxe Play Yard, and the Eddie Bauer Complete Care Play Yard. A child's weight presses the center of the bassinet downwards, increasing the angled surfaces at either end of the product. If a child is left unattended in the bassinet portion of the play yard, small movements of the child could cause the child to slide, posing a potential risk of injury or death due to suffocation. Consumers are advised to stop using the bassinet portion of the recalled play yards and contact Dorel Distribution Canada to receive a free kit to address the issue. See the Health Canada website for exact model numbers and details. The Bugaboo Bee stroller has been stroller has been recalled. One or both sides of the brakes can fail. Consumers are advised to stop using the recalled strollers and contact Bugaboo to receive a free repair kit, which can be ordered online at www.bugaboo.com. Dozens of recalls are issued each month by Health Canada. Click here to visit the Consumer Product Safety site and view all the Children's Product recalls. Allergy-suffering Moms who are not breastfeeding (it's safest not to take extra medications while breastfeeding): get a free 3-tablet trial pack of Reactive Allergy Extra-Strength. Trial offer not valid in Quebec, Nova Scotia, New Brunswick, Newfoundland, Prince Edward Island, Yukon, Northwest Territories or Nunavut. Click here to sign up for your free pack. Please Mum has a big sale on right now, get up to 50% off the entire store! The discount applies to the original ticketed price. The sale is both online and in-store. All their new arrivals are also 25% off - check out their Canada Day designs. The Proud to Be Canadian T-Shirt design contest winning entry is also available now for $8 (no discount), with proceeds going to Please Mum's Funds for Fun Foundation. Jamtots, based in Victoria, BC, is having an anniversary sale. They have items on sale both in-store and online! All items on clearance or in the seconds section have been reduced an additional 10%. 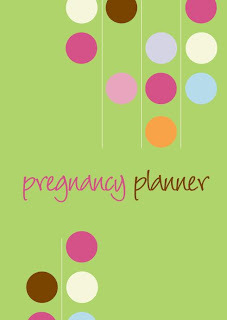 Use coupon code JUNE09NEWS to receive 10% off of your next order at BabyPlanetBoutique.com ! Shipping is free on orders of $100 or more. 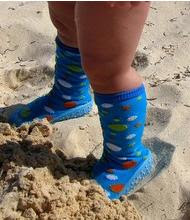 BabyPlanetBoutique.com carries cloth diapers and cloth diaper accessories, and a wide assortment of other baby products. Code expires June 30, 2009. Select KitchenAid blenders at www.shop.kitchenaid.ca are 25% off. Just use code BLEND25! The promo is on from June 1 - July 31, 2009. I blogged about this one before, but in case you missed it, go to www.KitchenAid90.ca to enter the KitchenAid 90th Anniversary Contest to win a 4 piece kitchen suite from KitchenAid Home Appliances valued at $8,000!